Way back in February Konect Sports previewed its new platform. The platform would put a sensor on each player and allow the sports team to track players before, during and after games to measure performance (and how to improve performance). After some testing it's finally launching the Konect Speed, a product born out of the platform, which focuses on reaction time. Each athlete puts on a Konect Speed during practice and drills, and it'll track their reaction time and store the data in a central system. The Speed uses a 3D motion sensor to capture the moment an athlete's core body moves. This is paired with target sensors on the field that will capture things like split times and pure speed. Together, the system will allow trainers to analyze an athlete's form in their respective sport. Since this is also a platform intended for sports teams to manage players, trainers can also use data to compare individual athletes. Data can be used to measure general athletic ability or ability related to specific sports, like soccer or football. Trainers can even focus down on specific types of body movements. To boost some intra-team competitive spirit, there's also a leaderboard that will display each athlete's times so that they can compete to improve. Coaches will also get to see which players are more agile or have better reaction time, adding data analytics to their arsenal when they make personnel decisions. 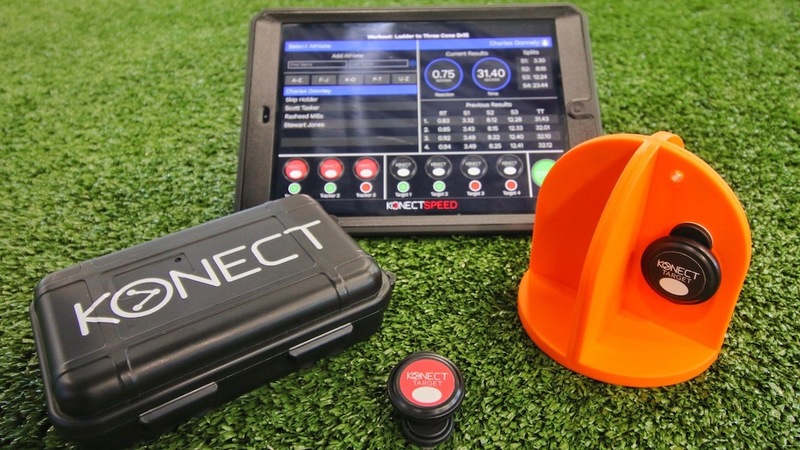 Konect has been testing Speed with teams from all levels, all the way down from the school level to the pro level. There are two versions available to purchase. The $299.95 Pro version, which is intended to solo athletes, comes with one Speed sensor, one target sensor, sensor mount and a protective traveling case. The $899.95 Pro Team bundle comes with three Speed sensors, three target sensors, three sensor mounts and a protective traveling case. All of them come with support for the companion Konect Sports app on iPad - for free, no subscription needed.